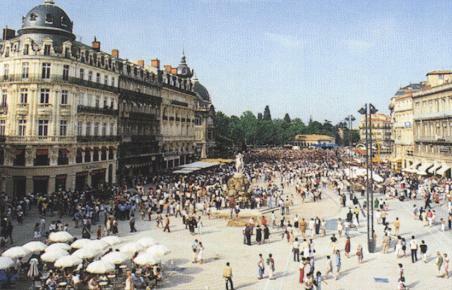 Last week I have been in Montpellier (France). The occasion was one of the most important as it was 25th anniversary of QCD Conference series that are held there with two year cadence. 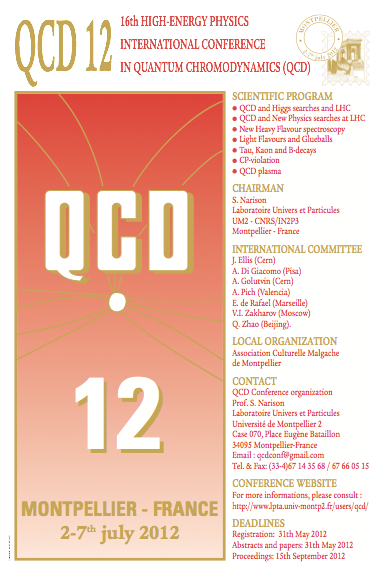 The organizer is Stephan Narison and this was QCD 10. 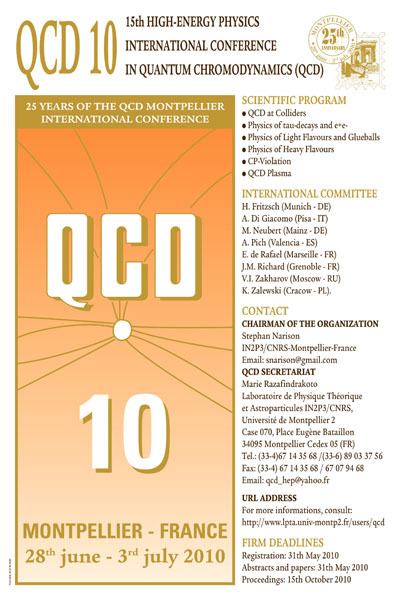 Thanks to Stephan, it is the third time that I have the opportunity to go to Montpellier to talk with him and other fine people about QCD. I have this opportunity also to learn a lot about this matter and to improve the quality of my research. This time, Stephan managed also to remember that are passed 31 years since the seminal SVZ paper on sum rules in QCD by Misha Shifman, Arkady Vainshtein and Valentine Zakharov that made a major breakthrough in the field. I have the luck to exchange some words with Prof. Zakharov and he was really illuminating about the current situation of different aspects of this field. I hope to see him in Ghent (Belgium) in the fall this year. He is one of the organizer of the conference The Many Faces of QCD and I am a registered participant. Misha Shifman was also there and showed how a track toward understanding confinement can be pursued passing through supersymmetry (see here). I take this chance to remember that Shifman, Vainshtein and Zakharov achieved a fundamental result in computing the exact beta function of supersymmetric QCD (see here) but to these notable names we must add the name of Novikov. The conference has been very well organized and the atmosphere was really friendly. Scientific content was absolutely interesting and some experimental groups presented firstly some new results here. You can take a look at all the talks here. Mine is this. About the questions that mostly urge me, I was impressed again by a talk of COMPASS Collaboration (see also here). They confirm their finding that gluons do not seem to weigh too much in determining proton spin. As you know, this is what I expect from my theoretical analysis for low-energy QCD. Proton spin is mostly due to quark spins and orbital motion, the latter for the larger part. Results from KLOE-2, at INFN of Frascati (Italy), are really striking. Talk is here. They have increasing evidence that resonance is indeed a glueball but they are not claiming this yet. The track they followed till now is a really smart one and implies studies of decay and studies of the invariant mass of the pair obtained from it. They also showed that has a significant glue component and this would imply (see also my talk), that its main decay process produces a particle. Indeed, what these researchers have found is the first clear evidence of the analogous of an excited atom in strong interactions and the corresponding decay into the emission of the corresponding force carrier. Their approach is really striking and it is my personal conviction that a lot more should be expected from this collaboration ending a long research for the first glueball. But strongly linked to this, there is an interesting theoretical analysis by Vincent Mathieu together with Vicente Vento that strongly support all these ideas about nature. Vincent gave the talk and we have had a very interesting exchange about. He was so kind to inform me about the conference at Ghent. We have had an interesting evening at a restaurant in Montpellier together with other very nice fellows (see below) about a riddle on a row of physicists, the colors of their hats and how to save their lives from a mad man aiming to kill all of them. When you go to a conference like this, the chance to meet very interesting people is the highest. Indeed, I have had the opportunity to meet three Italian researchers: Francesco Dettori at LHCb from University of Cagliari (Italy), Luca Mucibello at CMS from University of Antwerpen (Belgium) and Silvia Pisano from Orsay (France). 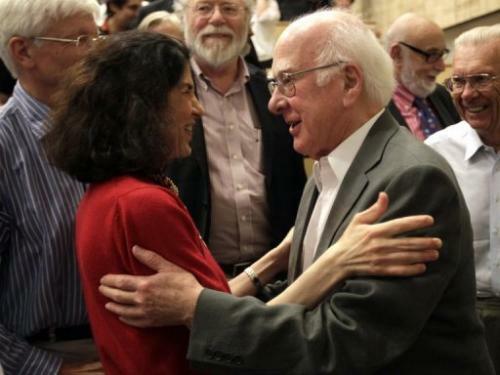 We have had a lot of good time and discussions of any kind, ranging from physics to politics and other. I am aware that science is an international enterprise but I am Italian and is really a satisfaction to see such smart young countrymen being part of it notwithstanding mortifications our politicians are giving them and to research at large. 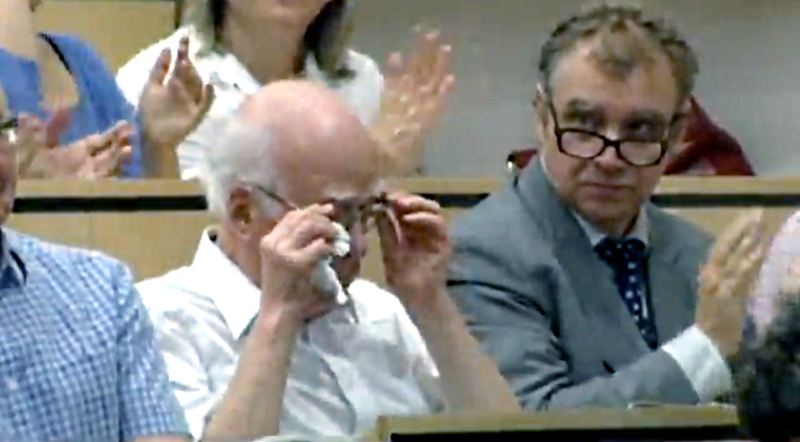 On a similar side, I have also met people like Mihail Iliescu that is working at INFN and after a lot of time has not yet a position. He told me that he lost a permanent position in Romania after heavy cuts from their government. He is collaborating to a very interesting experiment about Kaon atoms with SIDDHARTA Collaboration. The Conference was concluded with a dinner in a beautiful place near Montpellier. Stephan presented some dances from Madagascar while wine and food were really satisfactory. Then, after a walk downtown and a beer offered by Francesco, we left with the aim to maintain our bounds somehow. Again a great experience in Montpellier. Thank you very much, Stephan!